Your editor for Central Hove is Ian Grace. If you’ve got any queries about this area, or can add any information, photos or memories, please send My Brighton and Hove a message via the Comments form at the bottom of this page. I have lived in Brighton and Hove for most of my life. I first came here as a student in 1979 and never really left. For the last 15 years I’ve lived in Hove, mostly in Central Hove and although I live in Aldrington now, it is the central area which first captured my heart. Having said that, I first ventured into Central Hove as a student one evening with a group of friends, back in the winter of 1979, to explore the pubs and nightlife and it seemed a very different place then. At that time Hove had a slightly staid and stuffy image and I have to say that as we sat in the rather gloomy and cavernous Cliftonville Inn adjacent to Hove Station we didn’t find a great deal to make us change our minds. Today, Central Hove is a very different place. Church Road abounds with restaurants, cafes, pubs and bars and part of its charm is it’s obvious appeal to people of all ages. For me however it is the buildings and architecture of Central Hove which are it’s greatest attraction along with the seafront and Hove Lawns. Central Hove stretches roughly from Hove Street in the West to Grand Avenue and Palmeira Square in the East. To the North it reaches to the Old Shoreham Road and the English Channel marks it’s southern boundary. As with much of Brighton and Hove however, the boundaries are somewhat arbitrary and many residents and visitors to Central Hove would perceive the area to include other adjacent streets. The original heart of Hove was centred on Hove Street in the West of the area and it was originally a small fishing village, although farming and smuggling were also popular activities. Roman remains have been found, showing that it has been a centre of population for centuries. 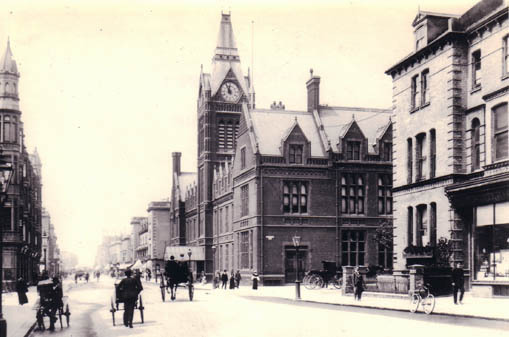 The growth of Hove was initially slow however, and even during the middle 19th Century there were still market gardens and fields of crops to be found in what is now regarded as Central Hove. Large-scale housing development was catalysed by the building of Brunswick Terrace and Brunswick Square, which borders Central Hove to the East. Building work started in the early 19th Century although by the mid 1840s much of Central Hove still consisted of farmland. A map of the area drawn in 1844 shows the town starting to take on the form we recognise today with Hove Street, the Ship Inn, Adelaide Crescent and Holland Road all clearly visible. The land above what is now Church Road is one area that remains almost entirely agricultural. The next major housing development was in the Cliftonville area in the middle of the 19th Century and during this period the current day street plan (incorporating streets such as Osbourne Villas and Medina Villas) was further developed with the creation of this popular neighbourhood. Cliftonville was developed on a piecemeal basis and a walk through its streets shows a wide range of styles and architectural features which contrast quite sharply with the more classical architecture to the West. More modest housing was built around George Street and further north towards what is now Hove Station. Even here however there is much of interest. Many of the houses in Denmark Villas represent attractive examples of domestic Victorian architecture and just north of the station is the old Dubarry Perfume factory. The attractive green and white mosaics on the walls will be the first thing many visitors to Hove will see when they get off the train and they perfectly illustrate the architectural and design features still to be found on many of the buildings. In the late 19th Century the Stanford estate was developed in the heart of Central Hove adjacent to the seafront. It was then that the majestic family residences of Grand Avenue and the adjacent Avenues (numbered First to Fourth), which give Hove so much of its character today, were built. Sadly many of the buildings in Grand Avenue were subsequently demolished to make way for smart but anonymous apartment blocks. Although it remains a wide and pleasant thoroughfare, it is necessary to explore the adjacent streets to get a real feel for what Victorian and Edwardian Hove must have been like. Despite the worrying current day trend towards demolishing old family houses and constructing modern apartment blocks, Central Hove still has many streets which contain beautiful examples of Victorian architecture. It is an area that is best explored by foot, especially since parking can be difficult and parking regulations are strictly enforced. Central Hove has something for everybody and the links below will take you to more information about many notable places in the area. I do not appear to have seen any mention of Dubarrys. The large perfumery factory running parallel with Hove railway Station. It employed many people including myself in 1954/55 and 1957/58. My father (manager printing dept) worked there for most of his working life, and moved to Eastleigh, Hants when Dubarrys were taken over by Richard Hudnutt (in the 60’s if I remember correctly) I would love to hear from anybody who remembers – Dubarrys and Standard Tablet Company? I completely agree with your comments about the worrying trend for demolishing family houses and replacing them with contemporary blocks of flats. Whilst these look good today, they will soon look as outdated and jaded and many of those built a few decades ago. Just look at the buildings in Grand Avenue! I hope the council’s policy changes before it’s too late. I agree that Dubarrys is an enigmatic building and I’d very much like to raise its profile on this website over the next few months. I can take some photos of the quite striking mosaics but would encourage anyone who can to contribute pictures or articles about the building or former employees, as I agree it’s a key Hove building! I am searching for Hove Villas which was on the 1901 census. Is it still standing and if so where? Any help would be much appreciated. Bearing in mind the writing on some old censuses can be hard to read, I wonder if you mean Hova Villas, which still consists of beautiful, mainly semi detached Victorian villas. Many of the houses carry their original names on the fanlights which seem to concentrate on derivatives of ‘Dorset’ for some reason! Hove Villas runs north-south down to Church Road, just along from the Town Hall. When I was a child I lived in a ground floor flat in 55, Denmark Villas and I remember the stove/grate that heated the flat my mother had to blacken and light every day. Also the front room was lined with mirrors from floor to ceiling, and there was a large old glass conservatory leading down into a walled garden with beautiful Victorian tiles on the floor. It also contained the bath! I think this would have been about 1963, and at that time the property had not been ‘improved’, I wonder what it is like now? Hi Ian – Interesting to see you`ve returned to the old stomping ground – I thought you were up in Southwark but I do agree Hove is nicer! I defected to Muswell Hill this year and was in the same chip shop queue as the great Ray Davies (the nearest Muswell has to a monument of course). Last time we spoke in 86 you had a 2CV which you are to be commended for..anyway it`s a good website. I always did think Hove had something about it but it wasn`t cool to say so then! Best wishes. I am keen to find out more about the Dubarry Perfume Factory and, in particular, the company that established it. The reason for my enquiry is that my late father married, as his second wife, a daughter of a Mr Pears who was, I was led to believe, the founder (or a son of the founder) of the firm. Any information would be gratefully received. I worked at Dubarry’s when it was ‘Colma Customer services’ for a while. Never knew what they really did! Ian, I now live in one of the eight residential apartments, produced whilst redevolopment was undertaken back in 2004, on the top floor of the building. If you ever need access for photographic or research reasons please get in touch. Many years ago my father told me that his great grandfather lived in a large house called Denmark Villa. He was a very wealthy man in the wine and spirit trade. I believe that the house is still standing in Denmark Villas, so named after the land was sold off and the houses built. Does anyone know if the floral clock is still at Palmiera Square? My Uncle Jack (Ernie) Howard helped to make it. I used to live in Adelaide Crescent in the basement of No.35. The house was called Marlborough Court and my name then was Edna Taylor. I remember there was a little tiny library and a greengrocers there and other shops too. The lady who used to serve in the greengrocers was called Bubbles and I remember getting our vinegar in a bottle which was filled for you. Regarding the Dubarry Perfume factory. I worked in that building for many years when it was Sound Diffusion/Collmain and it was a very eerie building. I was often the last one in the building at night. One of the many rumours about the place was that Lady Dubarry was found hanging on the top floor towards the Hove Villas end of the building. That was always a particularly cold area even in the middle of summer. We once had security guards in the building over one christmas, can’t remember the year, this one guard was convinced he had seen a ‘ghostly figure’ roaming the building and wouldnt go back into building. As I was the keyholder, I ended up there until a relief guard could come in. There are many more ghostly ‘incidents’ that happened, if your interested e-mail me at Ddazpower@aol.com for further details. I believe there is a ghostly presence in that building, although I am a sceptic when it comes to that sort of thing. Regarding Dubarrys, I worked there around 1957 or 58 in the printing department at £3 a week! They printed all the containers and wrapping for the Dubarry perfumery products, I well remember John Taylor who was in charge of the printing department. I left to take an apprenticeship as a compositor elsewhere, but Dubarrys was my intro to print! I am currently researching the Maxted family history and would love to hear from any who may remember my Great Aunt Alice Maud Maxted who worked at Durbarry’s Perfumery in the late 50’s through the 60’s. I have been told by her niece that she in fact died one lunchtime at the factory, apparently her collegues told he it was lunchtime and as she stood up she collapsed and died. Unfortunately I have not been able to trace her exact date of death, any help or stories of Alice would be appreciated. What a great site! I live in Tisbury Road and have done for 24 years. I would love to know how old the houses are and who built them. Would anyone know? The Floral Clock is still there and was repaired this year. It no longer uses carpet bedding but is still an attractive floral feature. Incidently the Christmas tree adjacent to the clock had its lights turned on by the Mayor Thursday 27th at 3-30pm. My late father Graham Webber was the chief accountant at DuBarry’s until 1964, when the company was taken over by Warner Hudnutt, and the whole family moved to Hampshire in June 1964. I grew up literally next door to the building. Hove Park Mansion was subdivided into flats and from birth until I was about eight the family lived on the top floor. I was interested to see the names of “Pears” and “Banks” on this web page – our neighbours in the flats were Mrs Banks (next door) and a reclusive lady called Miss Pears, who lived downstairs. Rob, if your building (yellow brick) has a sunflower motif running horizontally across brickwork, it is a Willett building. My old address of 65 The Drive was one and built in 1878. It was empty for its first 25 years as Willett was an overambitious developer. The area of his buildings is identified with the Council as The Willett Estate for conservation I.D. purposes and planning. It was great to see a message from Bernard Webber whose father I worked with/for at Dubarry’s, in his office. This would be about 1957 to 1958/9. My parents also moved to Chandlers Ford. Is it possible for him to contact me please. John, I remember your name. I don’t know how to contact you but my email is bernardwebber at hotmail dot com. I served an apprenticeship at Dubarrys & Standard Tablet from July 1957 for 5 years. During this time I learned to make and process the whole range of products. I did part time study and attained a degree in Chemistry. In July 1962 I became chief chemist. In 1964 I assisted in the transfer of many of the processes to Warner Lambert/ Richard Hudnut, and then worked in Eastleigh for three years before leaving to a new job. I transfered to Hampshire with John Taylor, George Kendall and Graham Webber. At Dubarrys I met the girl – Iris Nicholls( receptionist)- who became my wife (45years ago and still wed). I remember many people with whom I worked- presumably many have since departed this world. I wonder if Val Spicer remembers me. I will be very pleased to make contact with anyone interested to share memories. DIRECTORS: HARRY WILLIAM KILBY PEARS, Pharmaceutical Chemist (Chairman and Managing Director), 4, Hamilton Mansions, King’s Gardens, Hove, Sussex. ARCHIBALD VICKERS (Sales Director). 93, Drayton Gardens, Kensington, S.W.10. HARRY FRANK SLACK, Pharmaceutical Chemist (General Manager), 10, Wilbury Avenue, Hove, Sussex. BENJAMlIN CHARLES GREENING, Member of the Pharmaceutical Society, 32, Norton Road, Hove. OBJECTS OF THE COMPANY: The Company has been formed to acquire in the first instance the whole or a controlling majority of the issued shares of The Standard Tablet Co., Ltd., below referred to as the “existing company”, and then (by winding up that Company) the “Dubarry et Cie” undertaking and business and all the other undertakings and businesses of that Company and to carry on and extend such- businesses. The object of the present issue is to provide additional Capital for extending the present factories for which an adjoining site has been acquired, and for opening additional showrooms in London and the provinces. The existing Company was formed in 1910 with a small capital with the principal object of manufacturing Pharmaceutical Products. In 1916 owing to remarkable success having attended the Company’s efforts to effect improvements in the manufacture of Fine Soaps, Perfunery and Toilet Luxuries generally these goods were placed on the market; they immediately achieved great popularity and further Capital is required to take advantage of the growth of the demaand for such products. PRODUCTS. The Dubarrv Perfumery Products have in less than seven years established themselves in public favour. Many of such products have become articles of everyday use such as:- CREME SHALIMAR for the hands; TABLETS OF COMPRESSED BATH SALTS FLORAL BATH SOAP in the crystal shape tablet; PERFUMED BATH CRYSTALS; “DEBONAIR” SHAVING SOAP; GOLDEN MORN Toilet Luxuries; OLD ENGLISH LAVENDER SOAP; TALCUM POWDERS; FACE POWDERS; TOOTH PASTE; SAVON SUPERBE AVON; ROYAL SAVON DE LUXE. Whilst the well known Perfumes: “BLUE LAGOON”, “A BUNCH OF VIOLETS”, “FLEUR JETEE”, “HEART OF A ROSE”, “CHANSON SANS PAROLES”, “GOLDEN MORN”, “APRES LA PLUIE”, “GARDEN OF KAMA”, “DUBARRY’S EAU DE COLOGNE” and “DUBARRY’S LAVENDER BOUQUET” are supreme exampies of the perfumier’s art. FREEHOLD FACTORIES. The existing Company possesses one of the most perfectly equipped Factories in the South of England known as the Goldstone Laboratories, Hove, having a floor area of over 40,000 square feet with a frontage to Hove Station of 536 feet. The largest and newest Factories are Freehold and it is expected that the Freehold of the remaining Leasehold portion will shortly he acquired. MACHINERY: The Machinery is of the most up to date character for the manufacture of all Perfumery Products, fine Toilet Soaps, Tooth Pastes, Toilet Powders and general Pharmaceutical Preporations. The Box Making Factory is completely kitted with the latest English and American machines. These facilities render the Company independent of outside sources for its supply of high class Perfumery Cases, Soap Boxes, cartons, etc. The Printing Works are pefectly equiped for their purpose, with the latest machinery for Colour Printing, Label Embossing, etc enabling the Company to produce its own catalogues, labels and printed matter generally. The coloured inset in the prospectus is a specimen of the beautiful work carried out in this portion of the Works. The pharmaceutical products of the business enjoy a very high reputation and alone produce a very considerable and lucrative revenue. This section of the business also presents opportunities for extension. I’ve so enjoyed reading all your comments. I work for the council and am based in Hove Park Mansions. I work in the ground floor office on the corner of Newtown Road and Hove Park Villas and always wonder how this ground floor was originally arranged. If it was one large sitting room why does it have a whole wall of windows along the Newtown Road side? And was the door on the corner of Newtown Road original? It is with great interest that I have read the information regarding the Dubarry Perfumery Company, my grandfather being Harry Slack. Unfortunately, he died whilst I was very young but Dubarrys was always a fundamental part of my upbringing as you can imagine. The information on this page illuminates my own family history. I read with interest the comments on the Dubarry Perfumery company as I’ve often wondered about it whilst pulling in to it on the train. I am also intrigued by a building in Holland Road which has the words ‘The Young Women’s Christian Association’ engraved/carved in the masonry on top. I’ve tried looking in Hove Library upstairs but to no avail. I currently work as Office and Facilities Manager in a premises comprising three units at the western end of the Dubarry Perfumery building. As Darren has expressed, the building is exceptionally eerie at night, and even during the day we have witnessed such peculiarities as manual goods lift doors trying to yank themselves open. It’s hard to say what to make of it. This end of the building still has the appearance of an industrial premises, inside, with what may be the original Crittal windows in one section. I’m very interested to know more, particularly of any purported hauntings on the premises. I am interested in Albert Grant (1831-1899) who lived at 7 Queen’s Gardens from 1875-8 and his brother Maurice, who lived at 6 Palmeira Square. I have seen a reference that says that the Stanford Estate was designed by architect James Knowles (junior). Is there any local history source material for any of these facts? And for that matter, are the two addresses part of the Stanford development? Knowles went on to design a larger house for Grant and I am trying to establish a link from this time. Any pointers you could give would be much appreciated. Does anyone know when the large house on the west side of Grand Ave was demolished? It took up the whole side of Grand Ave from the seafront to Grand Ave Mansions. I’m working on a project to document the adverts that were printed by Dubarry and included in books of stamp from 1936 to 1939, and was interested to see the comments about the printing department above. It would be very useful to hear from anyone with knowledge of the printing dept. My email address is dr_paulr at yahoo dot com. My thanks to Ian Grace for access to this informative page – and can add that my personal interest concerns glass products from Dubarry. It would greatly assist some ongoing research into 1930s – 40s glassware, which this company retailed (for talc and perfume), and for which they were the registered design name. However, as is often the case, it would appear than although Dubarry were indeed the company for certain registered design Nos., they did not of course make the glass products themselves. Might any of the former employees recall details of who did manufacture the glass containers, or have access to records showing this information. Please do contact me by email if you have any information on this particular aspect of the Dubarry products, and my sincere thanks in advance for any assistance people are able to offer. Hi Gabi.if you contact me on ‘g.mead@sussex.ac.uk‘ I can send you a colour image of a Dubarry full-page advert from 1937. My thanks to Geoffrey for his kind assistance with my dissertation research into the Dubarry Perfumery Company. If any former employees, or anyone with information on Dubarry, especially the company’s pre-WW2 advertising and product design, would be willing to assist me with my research please contact me on gm136@uni.brighton.ac.uk. Any info and help would be much appreciated. Many thanks! I am interested in the history of the Victoria Terrace part of the Kingsway. I was trying to look up the age and history of the buildings and I found that it currently consists of Victoria Terrace (now 1-7), Albert Terrace and Alma Terrace, but got nothing much to go on about the age, apart from Alma Terrace being named after the Battle of Alma (circa 1854). I was wondering if anyone can help? Some parts of Victoria Terrace date from the mid 1830s (number 2 was put up to-let furnished in 1838), but was an uncompleted project of A H Wilds. The original was probably to have a pair of higher blocks (as 1 & 2) framing a lower central block, but this never transpired. Yolande, the best way to go about this is to work through a series of street directories and find when the various sections appear. The 1850s is a bit too early for detailed maps but B&H maps of that period will indicate where buildings are [or not!]. The best way to find this out is to visit the city archive at Falmer, ‘The Keep’. They have all that plus what rate books that have survived for the period. To see the maps you will need to take two utility bills and a photo ID but it is all free to use. The other material you do not need ID for. They are open Tues-Sat 0930-1700.